The 2 -5 players draw cards from a card supply in the middle of the table. During the game, the players try to specialize in a few colors, because at the end of the game, a player can score plus points for only 3 colors; the rest score minus points. The more cards a player has of a color, the more points he scores. The player with the most points wins. Each player takes one summary card. 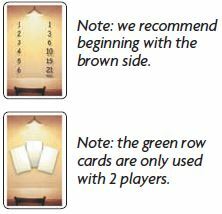 The players choose whether to play with the scoring table on the brown side or on the gray side of the summary card. With 3 to 5 players, play with the brown row cards. Place one row card in the middle of the table for each player in the game. Place the unused row cards back in the box. They will not be used in the game. With 3 players, remove the cards of one color from the game. Remove the 'last round' card from the deck and set it aside for now. Each player takes one card of a different color and places it on the table in his play area. Shuffle the remaining cards face down and place them face down in the middle of the table as a supply. Deal 15 cards face down from the supply in a stack. Place the 'last round' card on top of this stack of 15 cards. Then, place the rest of the card supply on top of this. The players choose a starting player by lot. Then the player's left neighbor takes a turn. When each player has taken a card row, the round ends and a new round begins. The player draws the top-most card from the supply and places it face up next to any of the row cards. Players may place at most 3 cards next to a row card. When there are 3 cards next to a row card, a player may not place another card in that row. When all row cards have 3 cards next to them, a player may not choose this action. The player must then take a card row. The player takes any of the row cards and all the cards next to it and places them face up in his play area The player then sorts the cards by color. If a player has taken a joker, he sets it aside for now. He must decide which color to place it with at the end of the game, but not sooner. A player may only take a row card if it has at least one card next to it. After a player has taken a card row in a round, he takes no more turns in this round, but plays again in the next round. When a player has taken a card row, he has a row card in his play area, so that all can see that he can take no more turns in this round. Note: if all players but one have passed, this player may continue to draw and place as many cards as he can and chooses before taking a card row and finishing the round! When every player has taken a card row, the round ends. Place the row cards back in the middle of the table and begin the next round with the player who took the last card row in the round just ended. When the 'last round' card is drawn, this indicates this is the last round. Place the card to the side to remind all players. Then the player draws the next card. At the end of the round, the players decide which color their jokers are (each may be different). Each player counts the cards he has in each color. The table shows the number of plus or minus points a player scores for the number of cards in each color. 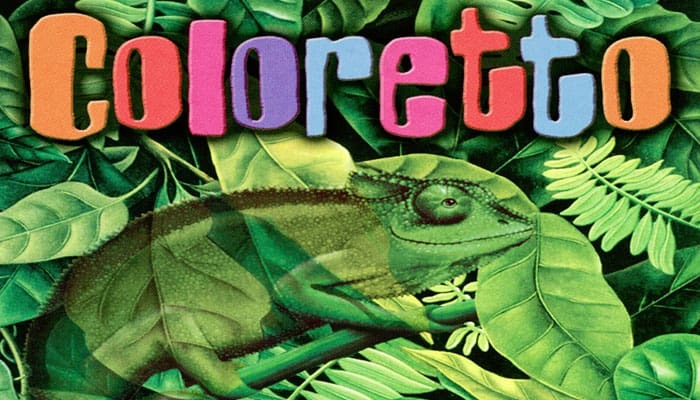 A player scores no extra points for more than 6 cards in a color. Each player chooses which 3 of his colors score plus points. All other colors score minus points for the player. Each '+2' card scores 2 plus points. Andy has 1 Joker, 1 '+2' card, 6 green cards, 4 yellow cards, 3 red cards, and 2 blue cards. As he already scores the most he can for his 6 green cards, he places his joker with his yellow cards. Before starting the game, remove two sets of cards (i.e. two colors) from the stack. Before the first turn, each player takes two cards in different colors. Use the green row cards instead of the brown ones. The number of cards that can be placed next to the row cards depends on the picture on the respective row card. When both players have taken a card row, the third row is removed from the game.